How are we in the last week of January? This month has been a whirlwind. My son’s birthday was this last week and I’ve been running around like a crazy woman, trying to put together a party. Everything turned out great, but I may or may not have eaten a little too much cake. Okay, a lot too much cake. Thank goodness I’ve got a menu plan to fall back on for the upcoming week. Menu planning is what keeps me on track and sane. If I’ve got a fridge and pantry stocked with all the ingredients I need for the week to come, I know I’ve got things under control. Okay, maybe not totally under control. 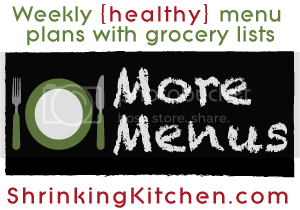 This week’s menu plan is full of delicious and interesting meals. Mediterranean inspired fish. Some pasta. A few one pan meals…and even a no cook salad. And the muffins? Yeah, to die for. I can’t wait to have those for breakfast with a steaming cup of coffee! Enjoy this week’s menu plan and the fleeting last weeks of summer! Monday: Mediterranean Fish and Quinoa and green salad. Tuesday: Chicken with Fire Roasted Tomato and Green Chile Sauce. Wednesday: Sneaky Cheesy Taco Macaroni with steamed green beans. Thursday: Harissa Salmon Cakes with a green salad. Sunday: Spicy Peanut Soup and a green salad.